Sir Isaac Newton was aided in his momentous discoveries by the most insignificant objects - even apples, feathers, and coal. Voltaire discusses the wondrous discoveries of Newton. THE DISCOVERIES which gained Sir Isaac Newton so universal a reputation, relate to the system of the world, to light, to geometrical infinities; and, lastly, to chronology, with which he used to amuse himself after the fatigue of his severer studies. I will now acquaint you (without prolixity if possible) with the few things I have been able to comprehend of all these sublime ideas. With regard to the system of our world disputes were a long time maintained, on the cause that turns the planets, and keeps them in their orbits; and on those causes which make all bodies here below descend towards the surface of the earth. The system of Descartes, explained and improved since his time, seemed to give a plausible reason for all those phenomena; and this reason seemed more just, as it is simple and intelligible to all capacities. But in philosophy, a student ought to doubt of the things he fancies he understands too easily, as much as of those he does not understand. Gravity, the falling of accelerated bodies on the earth, the revolution of the planets in their orbits, their rotations round their axis, all this is mere motion. Now motion cannot perhaps be conceived any otherwise than by impulsion; therefore all those bodies must be impelled. But by what are they impelled? All space is full, it therefore is filled with a very subtile matter, since this is imperceptible to us; this matter goes from west to east, since all the planets are carried from west to east. Thus from hypothesis to hypothesis, from one appearance to another, philosophers have imagined a vast whirlpool of subtile matter, in which the planets are carried round the sun: they also have created another particular vortex which floats in the great one, and which turns daily round the planets. When all this is done, it is pretended that gravity depends on this diurnal motion; for, say these, the velocity of the subtile matter that turns round our little vortex, must be seventeen times more rapid than that of the earth; or, in case its velocity is seventeen times greater than that of the earth, its centrifugal force must be vastly greater, and consequently impel all bodies towards the earth. This is the cause of gravity, according to the Cartesian system. But the theorist, before he calculated the centrifugal force and velocity of the subtile matter, should first have been certain that it existed. Sir Isaac Newton seems to have destroyed all these great and little vortices, both that which carries the planets round the sun, as well as the other which supposes every planet to turn on its own axis. First, with regard to the pretended little vortex of the earth, it is demonstrated that it must lose its motion by insensible degrees; it is demonstrated, that if the earth swims in a fluid, its density must be equal to that of the earth; and in case its density be the same, all the bodies we endeavour to move must meet with an insuperable resistance. With regard to the great vortices, they are still more chimerical, and it is impossible to make them agree with Kepler’s law, the truth of which has been demonstrated. Sir Isaac shows, that the revolution of the fluid in which Jupiter is supposed to be carried, is not the same with regard to the revolution of the fluid of the earth, as the revolution of Jupiter with respect to that of the earth. He proves, that as the planets make their revolutions in ellipses, and consequently being at a much greater distance one from the other in their Aphelia, and a little nearer in their Perihelia; the earth’s velocity, for instance, ought to be greater when it is nearer Venus and Mars, because the fluid that carries it along, being then more pressed, ought to have a greater motion; and yet it is even then that the earth’s motion is slower. He proves that there is no such thing as a celestial matter which goes from west to east since the comets traverse those spaces, sometimes from east to west, and at other times from north to south. In fine, the better to resolve, if possible, every difficulty, he proves, and even by experiments, that it is impossible there should be a plenum; and brings back the vacuum, which Aristotle and Descartes had banished from the world. Having by these and several other arguments destroyed the Cartesian vortices, he despaired of ever being able to discover whether there is a secret principle in nature which, at the same time, is the cause of the motion of all celestial bodies, and that of gravity on the earth. But being retired in 1666, upon account of the Plague, to a solitude near Cambridge; as he was walking one day in his garden, and saw some fruits fall from a tree, he fell into a profound meditation on that gravity, the cause of which had so long been sought, but in vain, by all the philosophers, whilst the vulgar think there is nothing mysterious in it. He said to himself, that from what height soever in our hemisphere, those bodies might descend, their fall would certainly be in the progression discovered by Galileo; and the spaces they run through would be as the square of the times. Why may not this power which causes heavy bodies to descend, and is the same without any sensible diminution at the remotest distance from the centre of the earth, or on the summits of the highest mountains, why, said Sir Isaac, may not this power extend as high as the moon? And in case its influence reaches so far, is it not very probable that this power retains it in its orbit, and determines its motion? But in case the moon obeys this principle (whatever it be) may we not conclude very naturally that the rest of the planets are equally subject to it? In case this power exists (which besides is proved) it must increase in an inverse ratio of the squares of the distances. All, therefore, that remains is, to examine how far a heavy body, which should fall upon the earth from a moderate height, would go; and how far in the same time, a body which should fall from the orbit of the moon, would descend. To find this, nothing is wanted but the measure of the earth, and the distance of the moon from it. Thus Sir Isaac Newton reasoned. But at that time the English had but a very imperfect measure of our globe, and depended on the uncertain supposition of mariners, who computed a degree to contain but sixty English miles, whereas it consists in reality of near seventy. As this false computation did not agree with the conclusions which Sir Isaac intended to draw from them, he laid aside this pursuit. A half-learned philosopher, remarkable only for his vanity, would have made the measure of the earth agree, anyhow, with his system. Sir Isaac, however, chose rather to quit the researches he was then engaged in. But after Mr. Picard had measured the earth exactly, by tracing that meridian which redounds so much to the honour of the French, Sir Isaac Newton resumed is former reflections, and found his account in Mr. Picard’s calculation. A circumstance which has always appeared wonderful to me, is that such sublime discoveries should have been made by the sole assistance of a quadrant and a little arithmetic. The circumference of the earth is 123,249,600 feet. This, among other things, is necessary to prove the system of attraction. The instant we know the earth’s circumference, and the distance of the moon, we know that of the moon’s orbit, and the diameter of this orbit. The moon performs its revolution in that orbit in twenty-seven days, seven hours, forty-three minutes. It is demonstrated, that the moon in its mean motion makes an hundred and fourscore and seven thousand nine hundred and sixty feet (of Paris) in a minute. It is likewise demonstrated, by a known theorem, that the central force which should make a body fall from the height of the moon, would make its velocity no more than fifteen Paris feet in a minute of time. Now if the law by which bodies gravitate and attract one another in an inverse ratio to the squares of the distances be true, if the same power acts according to that law throughout all nature, it is evident that as the earth is sixty semi-diameters distant from the moon, a heavy body must necessarily fall (on the earth) fifteen feet in the first second, and fifty-four thousand feet in the first minute.Now a heavy body falls, in reality, fifteen feet in the first second, and goes in the first minute fifty-four thousand feet, which number is the square of sixty multiplied by fifteen. Bodies, therefore, gravitate in an inverse ratio of the squares of the distances; consequently, what causes gravity on earth, and keeps the moon in its orbit, is one and the same power; it being demonstrated that the moon gravitates on the earth, which is the centre of its particular motion, it is demonstrated that the earth and the moon gravitate on the sun which is the centre of their annual motion. The rest of the planets must be subject to this general law; and if this law exists, these planets must follow the laws which Kepler discovered. All these laws, all these relations are indeed observed by the planets with the utmost exactness; therefore, the power of attraction causes all the planets to gravitate towards the sun, in like manner as the moon gravitates towards our globe. Finally as in all bodies re-action is equal to action, it is certain that the earth gravitates also towards the moon; and that the sun gravitates towards both. That every one of the satellites of Saturn gravitates towards the other four, and the other four towards it; all five towards Saturn, and Saturn towards all. That it is the same with regard to Jupiter; and that all these globes are attracted by the sun, which is reciprocally attracted by them. 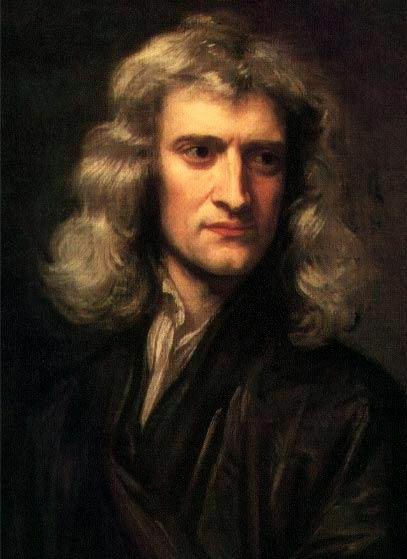 This power of gravitation acts proportionably to the quantity of matter in bodies, a truth, which Sir Isaac has demonstrated by experiments. This new discovery has been of use to show that the sun (the centre of the planetary system) attracts them all in a direct ratio of their quantity of matter combined with their nearness. From hence Sir Isaac, rising by degrees to discoveries which seemed not to be formed for the human mind, is bold enough to compute the quantity of matter contained in the sun and in every planet; and in this manner shows, from the simple laws of mechanics, that every celestial globe ought necessarily to be where it is placed. His bare principle of the laws of gravitation accounts for all the apparent inequalities in the course of the celestial globes. The variations of the moon are a necessary consequence of those laws. Moreover, the reason is evidently seen why the nodes of the moon perform their revolutions in nineteen years, and those of the earth in about twenty-six thousand. The several appearances observed in the tides are also a very simple effect of this attraction. The proximity of the moon, when at the full, and when it is new, and its distance in the quadratures or quarters, combined with the action of the sun, exhibit a sensible reason why the ocean swells and sinks. After having shown by his sublime theory the course and inequalities of the planets, he subjects comets to the same law. The orbit of these fires (unknown for so great a series of years), which was the terror of mankind and the rock against which philosophy split, placed by Aristotle below the moon, and sent back by Descartes above the sphere of Saturn, is at last placed in its proper seat by Sir Isaac Newton. He proves that comets are solid bodies which move in the sphere of the sun’s activity, and that they describe an ellipsis so very eccentric, and so near to parabolas, that certain comets must take up above five hundred years in their revolution. The learned Dr. Halley is of opinion that the comet seen in 1680 is the same which appeared in Julius Cæsar’s time. This shows more than any other that comets are hard, opaque bodies; for it descended so near to the sun, as to come within a sixth part of the diameter of this planet from it, and consequently might have contracted a degree of heat two thousand times stronger than that of red-hot iron; and would have been soon dispersed in vapour, had it not been a firm, dense body. The guessing the course of comets began then to be very much in vogue. The celebrated Bernoulli concluded by his system than the famous comet of 1680 would appear again the 17th of May, 1719. Not a single astronomer in Europe went to bed that night. However, they needed not to have broke their rest, for the famous comet never appeared. There is at least more cunning, if not more certainty, in fixing its return to so remote a distance as five hundred and seventy-five years. As to Mr. Whiston, he affirmed very seriously that in the time of the Deluge a comet overflowed the terrestrial globe. And he was so unreasonable as to wonder that people laughed at him for making such an assertion. The ancients were almost in the same way of thinking with Mr. Whiston, and fancied that comets were always the forerunners of some great calamity which was to befall mankind. Sir Isaac Newton, on the contrary, suspected that they are very beneficent, and that vapours exhale from them merely to nourish and vivify the planets, which imbibe in their course the several particles the sun has detached from the comets, an opinion which, at least, is more probable than the former. But this is not all. If this power of gravitation or attraction acts on all the celestial globes, it acts undoubtedly on the several parts of these globes. For in case bodies attract one another in proportion to the quantity of matter contained in them, it can only be in proportion to the quantity of their parts; and if this power is found in the whole, it is undoubtedly in the half, in the quarter, in the eighth part, and so on in infinitum. This is attraction, the great spring by which all Nature is moved. Sir Isaac Newton, after having demonstrated the existence of this principle, plainly foresaw that its very name would offend; and, therefore, this philosopher, in more places than one of his books, gives the reader some caution about it. He bids him beware of confounding this name with what the ancients called occult qualities, but to be satisfied with knowing that there is in all bodies a central force, which acts to the utmost limits of the universe, according to the invariable laws of mechanics. It is surprising, after the solemn protestations Sir Isaac made, that such eminent men as Mr. Sorin and M. de Fontenelle should have imputed to this great philosopher the verbal and chimerical way of reasoning of the Aristotelians; Mr. Sorin in the Memoirs of the Academy of 1709, and M. de Fontenelle in the very eulogium of Sir Isaac Newton. Sir Isaac might have answered these critics thus:—“First, you have as imperfect an idea of the word impulsion as of that of attraction; and in case you cannot conceive how one body tends towards the centre of another body, neither can you conceive by what power one body can impel another. “Secondly, I could not admit of impulsion; for to do this I must have known that a celestial matter was the agent. But so far from knowing that there is any such matter, I have proved it to be merely imaginary. Vortices may be called an occult quality because their existence was never proved. Attraction, on the contrary, is a real thing because its effects are demonstrated, and the proportions of it are calculated. The cause of this cause is among the Arcana of the Almighty. THE PHILOSOPHERS of the last age found out a new universe; and a circumstance which made its discovery more difficult was that no one had so much as suspected its existence. The most sage and judicious were of opinion that it was a frantic rashness to dare so much as to imagine that it was possible to guess the laws by which the celestial bodies move and the manner how light acts. Galileo, by his astronomical discoveries, Kepler, by his calculation, Descartes (at least, in his dioptrics), and Sir Isaac Newton, in all his works, severally saw the mechanism of the springs of the world. The geometricians have subjected infinity to the laws of calculation. The circulation of the blood in animals, and of the sap in vegetables, have changed the face of Nature with regard to us. A new kind of existence has been given to bodies in the air-pump. By the assistance of telescopes bodies have been brought nearer to one another. Finally, the several discoveries which Sir Isaac Newton has made on light are equal to the boldest things which the curiosity of man could expect after so many philosophical novelties. Till Antonio de Dominis the rainbow was considered as an inexplicable miracle. This philosopher guessed that it was a necessary effect of the sun and rain. Descartes gained immortal fame by his mathematical explication of this so natural a phenomenon. He calculated the reflections and refractions of light in drops of rain. And his sagacity on this occasion was at that time looked upon as next to divine. But what would he have said had it been proved to him that he was mistaken in the nature of light; that he had not the least reason to maintain that it is a globular body? That it is false to assert that this matter, spreading itself through the whole, waits only to be projected forward by the sun, in order to be put in action, in like manner as a long staff acts at one end when pushed forward by the other. That light is certainly darted by the sun; in fine, that light is transmitted from the sun to the earth in about seven minutes through a cannon-ball, which were not to lose any of its velocity, could not go that distance in less than twenty-five years. How great would have been his astonishment had he been told that light does not reflect directly by impinging against the solid parts of bodies, that bodies are not transparent when they have large pores, and that a man should arise who would demonstrate all these paradoxes, and anatomise a single ray of light with more dexterity than the ablest artist dissects a human body. This man is come. Sir Isaac Newton has demonstrated to the eye, by the bare assistance of the prism, that light is a composition of coloured rays, which, being united, form white colour. A single ray is by him divided into seven, which all fall upon a piece of linen, or a sheet of white paper, in their order, one above the other, and at unequal distances. The first is red, the second orange, the third yellow, the fourth green, the fifth blue, the sixth indigo, the seventh a violet-purple. Each of these rays, transmitted afterwards by a hundred other prisms, will never change the colour it bears; in like manner, as gold, when completely purged from its dross, will never change afterwards in the crucible. As a superabundant proof that each of these elementary rays has inherently in itself that which forms its colour to the eye, take a small piece of yellow wood, for instance, and set it in the ray of a red colour; this wood will instantly be tinged red. But set it in the ray of a green colour, it assumes a green colour, and so of all the rest. From what cause, therefore, do colours arise in Nature? It is nothing but the disposition of bodies to reflect the rays of a certain order and to absorb all the rest. What, then, is this secret disposition? Sir Isaac Newton demonstrates that it is nothing more than the density of the small constituent particles of which a body is composed. And how is this reflection performed? It was supposed to arise from the rebounding of the rays, in the same manner as a ball on the surface of a solid body. But this is a mistake, for Sir Isaac taught the astonished philosophers that bodies are opaque for no other reason but because their pores are large, that light reflects on our eyes from the very bosom of those pores, that the smaller the pores of a body are the more such a body is transparent. Thus paper, which reflects the light when dry, transmits it when oiled, because the oil, by filling its pores, makes them much smaller. It is there that examining the vast porosity of bodies, every particle having its pores, and every particle of those particles having its own, he shows we are not certain that there is a cubic inch of solid matter in the universe, so far are we from conceiving what matter is. Having thus divided, as it were, light into its elements, and carried the sagacity of his discoveries so far as to prove the method of distinguishing compound colours from such as are primitive, he shows that these elementary rays, separated by the prism, are ranged in their order for no other reason but because they are refracted in that very order; and it is this property (unknown till he discovered it) of breaking or splitting in this proportion; it is this unequal refraction of rays, this power of refracting the red less than the orange colour, &c., which he calls the different refrangibility. The most reflexible rays are the most refrangible, and from hence he evinces that the same power is the cause both of the reflection and refraction of light. But all these wonders are merely but the opening of his discoveries. He found out the secret to see the vibrations or fits of light which come and go incessantly, and which either transmit light or reflect it, according to the density of the parts they meet with. He has presumed to calculate the density of the particles of air necessary between two glasses, the one flat, the other convex on one side, set one upon the other, in order to operate such a transmission or reflection, or to form such and such a colour. From all these combinations he discovers the proportion in which light acts on bodies and bodies act on light. He saw light so perfectly, that he has determined to what degree of perfection the art of increasing it, and of assisting our eyes by telescopes, can be carried. Descartes, from a noble confidence that was very excusable, considering how strongly he was fired at the first discoveries he made in an art which he almost first found out; Descartes, I say, hoped to discover in the stars, by the assistance of telescopes, objects as small as those we discern upon the earth. But Sir Isaac has shown that dioptric telescopes cannot be brought to a greater perfection, because of that refraction, and of that very refrangibility, which at the same time that they bring objects nearer to us, scatter too much the elementary rays. He has calculated in these glasses the proportion of the scattering of the red and of the blue rays; and proceeding so far as to demonstrate things which were not supposed even to exist, he examines the inequalities which arise from the shape or figure of the glass, and that which arises from the refrangibility. He finds that the object glass of the telescope being convex on one side and flat on the other, in case the flat side be turned towards the object, the error which arises from the construction and position of the glass is above five thousand times less than the error which arises from the refrangibility; and, therefore, that the shape or figure of the glasses is not the cause why telescopes cannot be carried to a greater perfection, but arises wholly from the nature of light. For this reason he invented a telescope, which discovers objects by reflection, and not by refraction. Telescopes of this new kind are very hard to make, and their use is not easy; but, according to the English, a reflective telescope of but five feet has the same effect as another of a hundred feet in length.